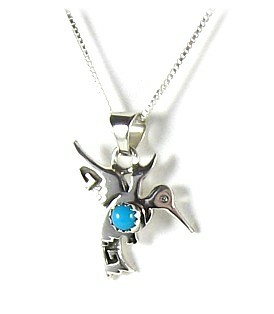 This enchanting Sterling Silver Hummingbird, engraved with Navajo symbols and embellished with Turquoise brings joy to its wearer. For in Navajo legend, the Hummingbird is associated with the Ghost Shirt religion and is believed to have magical qualities because it can fly in any direction and even appear motionless. Through this "dance" the Hummingbird brings joy and beauty and also conjures up love, for it is said that Hummingbird Feathers open the heart!